“I’m a Good Man but a Poor Man” is a 1949 song by 36 year old Cecil Gant on the album “Bullet Boogie”. 5 years prior, he emerged from World War II as a pianist with his first hit, “I Wonder”. He died in 1952. In 1998, B.B. 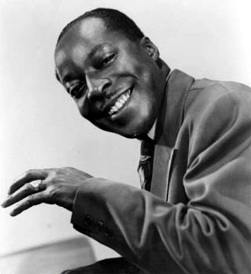 King recorded it, but changed the lyrics slightly and renamed it “Blues Man” in his version. This was an easy one. I worked out the chords in this tuning, added a bass line and a slide solo, and recorded it over 2 nights. Then we added the vocals a week later and it was done. Very few effects were used and the mix was straightforward. It’s a song about a poor man. Bono once said of his experience recording the vocals for “Red Hill Mining Town” (from The Joshua Tree album) that when it was played back, it sounded like a rich man. “Why, when it’s a song about unemployment?”, he asked the recording engineer, Flood. “I keep telling these guys, just because we have stereo reverb doesn’t mean we have to use it!,” Flood replied. He turned the reverb off, moved the vocal slightly to one side, and fixed it. It was recorded with a JTV-59 Variax’s 1958 Gibson Les Paul Standard (“Lester”, bridge) -> Line 6’s Budda Superdrive amp (“2001 Zen Master”). The slide solo was a JTV-59 Variax’s 1961 Gibson ES-335 (“Semi”, bridge) - with a Herdim pick held sideways to get the punchy/scratchy sound. A mic’ed 12 string acoustic guitar was added. The song structure is: Intro (with verse chords, 8 bars) / Verse 1 (“I travelled...”) / Verse 2 (“Went down to the train station...”) / Break (8 bars) / slide solo (verse chords) / Verse 3 (“I’ll be alright baby...”) / outro (2 bars). 81 bpm. I'm sharing the tabs here not because the playing is anything special, on the contrary, because it is not. The tuning used allows for chords and sounds that are not possible otherwise. Most of the chords, harmonies, and the slide solo here, simple as they are to play, have probably never been played/heard from a guitar before. ... and FYI here are what the same chords would be, note for note, in standard tuning. You could get most of it with a capo 1, but it is awkward. In some places, it's impossible to play - and overall, these are not chord voicings or transitions that any guitar player has likely ever used before. ... and FYI here's what the same chords would be, note for note, in standard tuning. In open G#6 tuning (8 bar slide solo, as played). There is a sound you get from the ghost notes (where the slide rubs on strings not being picked) which you can't get in any other tuning. All text copyright © 2015 Tim Darling.